You probably have a realistic expectation for your cat’s behavior. If it is occasionally doing something it isn’t supposed to do, you are probably not surprised by it. However, you may be wondering if it's okay to discipline a cat for consistently bad behavior. Jumping on top of counters, chewing on wires, urinating outside of the litter box, and scratching household items that are not designed to be scratched are all common unwanted cat behaviors. Some of these behaviors are natural reactions to a cat’s environment, while others are simply bad habits. Regardless of what bad or unwanted behavior your cat is demonstrating, you probably want to stop it. Fortunately, that is entirely possible. Cats are smarter than many people think and they have a great memory. Experts state that cats have both long-term and short-term memory so they are trainable. At the same time, it also means they know what they can get away with repeatedly. Pets, like people, react well to positive reinforcement, so cats will remember when they get something they enjoy. Most cats like attention, food, toys, or all three. Choose a motivator that you can use to entice your cat to do what you want it to do and to provide it with a form of positive reinforcement. If possible, reward your cat with this special item only when training for this particular behavior. By reserving the desirable item for training, it will add to the value of the reward and make it that much more enticing to your cat. If you are struggling to find an item that your cat is motivated by, consider things like tuna, canned spray cheese, shrimp, and catnip toys. These may be items that your cat has never experienced before, so they may help in getting your cat’s attention. Shake a noisy can: If you see your cat jump on the counters or somewhere it shouldn't be, shake a can with some pennies in it to startle your cat. Use deterrents: Some cats dislike citrus smells, red pepper flakes, and commercially available sprays designed to keep cats away from certain areas. There are also special sprays that taste bad to deter pets from chewing on things. Use a water spray bottle: No one, including cats, likes to be squirted with water. Try a quick spritz at your cat if they are somewhere or doing something they shouldn't be. It's likely that after a few times, just reaching for the spray bottle deters the bad behavior. Use double-sided tape or aluminum foil: These simple things can be placed on surfaces you don't want your cat on or scratching. Cats do not like the textures. Say something: Startle your cat with a loud "ouch" or another word to end any rough behavior. This is effective for cats that are aggressive with people and may bite or grab onto your arm or leg. Give a timeout: Gently put your cat in a bathroom or other room without any people in it for 20 minutes if it is misbehaving. Quite often, it will emerge from the room with a different attitude. Whenever possible, give treats, praise, and attention to your cat if it is behaving nicely. If you notice it lying next to something it used to chew, reward it. If you notice it scratching the scratching pole instead of your sofa, reward it. Your cat will quickly learn the difference between good and bad behavior. It is important that you never physically hurt your cat. This includes spanking, hitting, kicking, or hurting your cat intentionally. Attempting to teach a cat a lesson through physical means does not work and can actually lead to more disruptive, even aggressive, behavior. Do not scruff your cat. This is no longer recommended as a method of restraint or transport for adult cats. Scruffing is painful and when you cause a misbehaving cat pain, it will only further exacerbate an issue. It is also thought that what appeared to be relaxation for some cats who are scruffed is actually fear paralysis. An alternative to grabbing a cat by the scruff is putting a blanket over it and scooping the cat up inside it. This will keep you and the cat safe and allow you to transport the cat without stressing it out further. What Are My Cat's Eyes Telling Me? 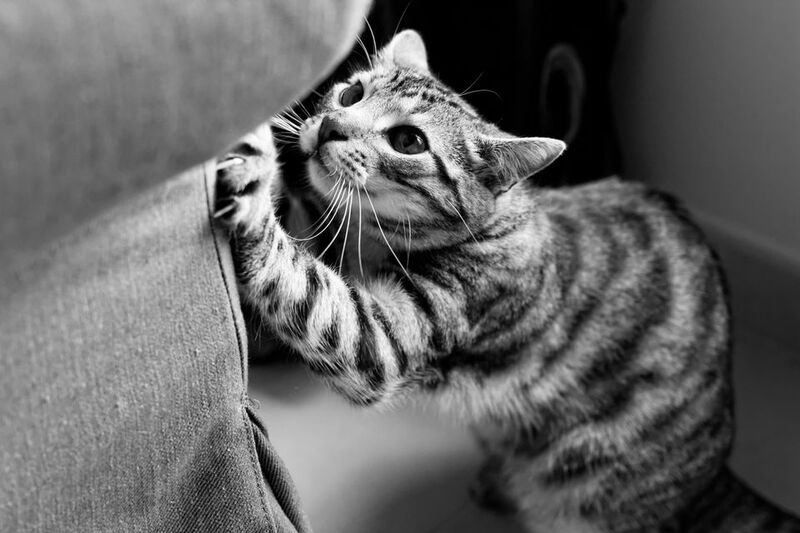 What Can You Do About Your Cat's Attention-Seeking Behavior? What Do Your Cat's Meows Mean?